There has been an overwhelming amount of disasters and storms throughout the USA and the World recently. Call it global warming, Mother Nature's Fury, or God's way of getting our attention--whatever the reason, this world is full of brutal storms. Tornadoes, typhoons, hurricanes, tsunami's, floods, earthquakes, mudslides, volcanoes, and ice storms all in places unheard of. The birds don't know where to fly anymore, since the south is getting severe winter storms as well. It seems nothing is safe or sacred, and storms are becoming a natural part of life. Like it not, in life we are either in the midst of a storm, one is on the way, or we've just come through one. 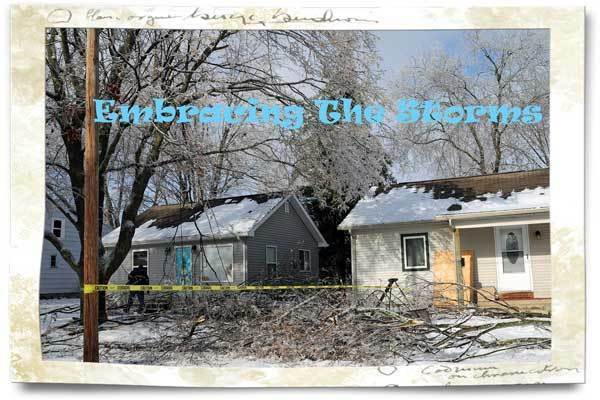 Storms can be devastating, debilitating, disabling. But we don't have to let our storms in life, our circumstances, or the unpredictability of life keep us down. One of the biggest storms in my life was losing my son, Brian. When he suddenly passed away, it felt as though everything in my life had been stripped away. Suddenly I didn't care, I had no strength, or even the desire to go on. How could I? My situation was hopeless. Nothing I could do would ever bring him back. Then one day, God led me to a writing on a painted rock "Life isn't about the storms in life, it's about dancing in the rain." It was a bittersweet time, for sure. But I learned to dance again and celebrate the memories of my son and all the storms God had brought him and our family through. Too many times when storms come, our first reaction is to run full speed ahead. You ever try to outrun a tornado? Some have, but most have paid with their lives. There is a time, to accept the fact that you are going to have to embrace this storm, and head for shelter. As humans, we often want others to share in our storm, comfort us, and help us through it. Sadly, people often let us down. When we panic, fret and fear, we are only making our situation worse. Stress and worry are the leading cause of all kinds of health issues. Besides, worrying and stressing will not change our situation or lessen the storm. Jesus' disciples went through a horrendous storm while out in a boat. When the waves began to spill over into the boat, they freaked out and were panicking because Jesus was asleep. The disciples woke Jesus and said, “Teacher, don't you care that we are about to die?” Jesus stood up and commanded the wind, “Be quiet!” and he said to the waves, “Be still!” The wind died down, and there was a great calm. Mark 4:37-39. Take your storm(s) to Jesus and experience the peace and calmness that only he can bring. Too many times we let storms bring us down, but in Isaiah 40:31 the Bible says, "Those who trust in the Lord for help will find their strength renewed. They will rise on wings like Eagles; they will run and not get weary; they will walk and not grow weak." Did you know that Eagles can actually fly above the clouds and storms in life? We can too! God designed us this way. You were meant to fly, not stumble through life. Next time you're facing a storm, use your wings to soar through it. Over 100,000 people in various states lost power recently due to the violent winter storms that hit much of the USA. Here, in our own community 50,000 people were out at one time. Thankfully, our power was only out briefly twice, so we used our home to help others in need. When our power is out, we begin to realize those blessings we often take for granted, like our lights, heat, and the security of having all our power sources running efficiently. Cut off from power, we basically have limited capabilities to what we can do and our entire economy suffers until the power is restored. It's the same with our spirit. Many times we are tapping into other sources for power, but we find that they soon fail us too. The real power source is God. When we plug ourselves into him we have a magical power that has no limits or barriers. There are various ways we can plug into this miraculous power source. Through our praise, prayer, worship with other believers, and reading his word, we develop a close relationship with God that keeps our power source fully functioning so we can help our family, friends, and others who are without power. Lisa Freeman is an Award-Winning Author, Motivational Speaker, and Dog Trainer from Owosso, Michigan who loves to empower others to overcome the storms and circumstances in life to reach their highest potential.